Champagne Drappier is a fairly small family owned house founded in1808 and in the far south of Champagne, in Urville in the Aube district. Although they also have a cellar in Reims, most of their grapes come from Aube and being in the south they tend to ripen more than most grapes in the Champagne region making their wines powerful and full bodied. The house style is powerful and designed primarily to please the palate, but with plenty of excitement for the intellect as well. Supposedly one of the Favorites of Charles de Gaulle, I'll simply add that General Chuck had great taste. He often chose Drappier for receptions at Colombey-les-Deux-Eglises. I am a big fan of Drappier as well. In the 1930s Pinot Noir was first planted in the region by Georges Collot, the grandfather of Michel Drappier who runs the house today. This was a controversial move at the time and he was mocked by many ("Father Pinot" they called him), but now Pinot Noir accounts for 70% of Drappiers vines, and approximately 75% in the region. In 1952 André Drappier introduced Pinot Meunier which is more frost resistant, as 95% of the grapes were wiped out by a surprise frost that year. 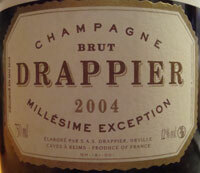 Drappier is perhaps the only consistent producer of Champagne in really big bottles, larger than the 3 liter Jeroboam. See Champagne bottle sizes for more. Brut Nature - This is a 100% Pinot Noir wine, a Blanc de noirs, with zero added dosage meaning sugar. A non vintage wine and a very pure expression of Champagne. I tried this on 13 Dec 2011 at the Blanchards of Allston Sparkling wine tasting, and my notes read "Nose: dry apples and minerals, bananas. Quite dry, balanced, some zest, tightly wound." I liked the wine and preferred it to the Cedric Bouchard Inflorescence Blanc de Noir and the 2007 Schramsberg Blanc de Noirs Brut, all tasted half blind in the same flight (we knew the wines but not which was in which glass). And now on June 1 of 2013 I'm trying it again - TN below! Carte d'Or - Perhaps their best known (and selling) wine, it is 80 to 90% Pinot Noir, 5 to 15% Chardonnay, and 5% Pinot Meunier. This is very much the essence of the Drappier style, pleasing to the stomach with lots of vinocity and certainly a bit gourmand but with plenty of finesse and elegance. The distinctive yellow and gold label is easy to spot. Brut Rose - A non-vintage Rose, very fruit forward, and 100% Pinot Noir. it is made by the saignée method (the color is from skin contact) and they blend in about 10% Pinot Noir vinified as white wine so that it is not too dark in color or intense. The color can change from year to year as they feel it's more important to let the fruit express itself than to have consistency of color, and Drappier also states this can go with anything except coffee and chocolates. It is an extroverted wine. Millesieme Exception - A vintage wine with approximately 65% Pinot Noir, 30% Chardonnay and 5% Pinot Meunier depending on the vintage. I'm looking at a bottle as I type, and I just may pop the cork and write it up in the next few days. Grande Sendrée and Grand Sendrée Rose - This is their greatest wine, vintage, and of course only made in the best years. A very rare single vineyard Champagne, it is made from a parcel of old vines in the Grand Sendrée vineyard. Intense, complex, and long, it is regarded as one of the best prestige cuvees. 55% Pinot Noir and 45% Chardonnay, they also make tiny quantities of a 100% Pinot Noir Rose. 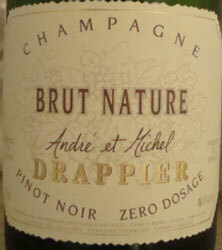 Tasting Note: Drappier Brut Nature - June 2013, rated B+/A- lovely and a candidate for decanting! My second time tasting this 100% Pinot Noir wine and a chance to better experience it than with another 16 or so sparklers like last time! A medium to robust yellow. An absolutely lovely minerally and chalky nose. Some orange zest. Peach pit and bananas as it breathes/warms. Definite apple after an hour+ of air, and a touch of pineapple. Quite sweet tasting initially especially for a Brut Nature (no added sugar) but then again Drappier is in the far south of Champagne where the grapes ripen more thoroughly. In reality it is quite dry but very well balanced. Slight red berries on the palate. Spicy, as in perhaps lemon zest. Bananas with time under the lovely minerality. Like the nose, after an hour+ of air there is apple and a smidge of pineapple. It becomes more and more tropical with air and warming, while staying 100% Champagne. Lovely! A golden yellow color with medium sized bubbles. On the nose, chalk and minerals with a touch of grapefruit and orange colored citrus. As it warms and breathes, the nose becomes creamy and more powerful, with custard like aromas. On the palate, minerals, golden apples, some creaminess, and a Pinot Noir style powerfulness. This wine only shows okay at refrigerator temperature, but really struts its stuff as it warms. For an entry level NV, I'm impressed. This wasn't really a fair tasting, as the Drappier followed two Rose Champagnes, but it still showed well and half the people rated it their wine of the night. We really should have had this bottle first to be fair. The nose was fruity, with banana, white flowers, and dry honey. The palate also had bananas, honey, a little apple, and some citrus as it warmed. A video visit to Champagne Drappier, in French, but worth watching regardless of your language skills.